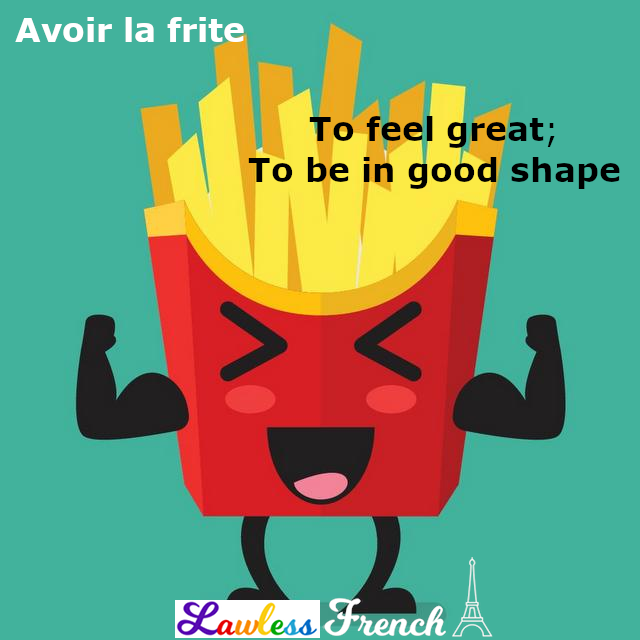 Usage notes: The French idiom avoir la frite, "to feel great," evolved from the synonymous expression avoir la patate. Patate is a familiar synonym for "head," and since frites are made from patates, frite became another. 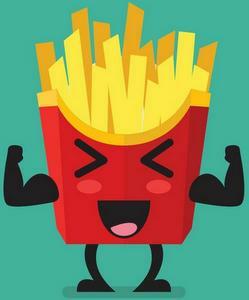 The original meaning refers to mental health, but avoir la frite can indicate excellent physical shape as well. Tiens, tu as la frite aujourd’hui ! Hey, you’re in a great mood today! Elle n’a pas la frite depuis longtemps. She hasn’t been well for a long time. Avoir is used for one’s current, ongoing state of being. You can use other verbs to refer to a temporary or changing status. Je ne sais pas quoi faire pour te donner la frite. I don’t know what to do to cheer you up. En dépit de ses problèmes, elle garde toujours la frite. Despite her problems, she always remains positive. être bien dans sa peau – literally, "to be well in one’s skin"
avoir la banane – "to have the banana"
Some sources translate avoir la frite as “to be full of beans," but this is only accurate in British English. In American English, being full of beans means “talking nonsense,” which in French is equivalent to dire des bêtises or dire n’importe quoi.